360Learning is a startup dedicated to online learning for corporations, based on collaborative and social Learning Managment Software. 360Learning has implemented a very specific organization with its employees, that fosters accelerated growth while maintaing a rational and healthy work environment for its employees. Morgane Mallejac, VP Brand & Culture, gives us a glimpse into 360learning framework. 1) NB: What is the business of 360learning.com? Morgane: 360Learning is a B2B startup created in 2010 which offers a digital learning platform able to drive interactions and engagement amongst its users (LMS = Learning Management Software) – unlike traditional e-learning solutions. We focus on ergonomy, design & data to develop a product allowing everyone, without any specific technical skills, to create, deliver and track its own online courses. Today, we have over 900 clients in 120 countries, mainly major corporate companies & training organizations (business schools, consultancy firms, etc). Since the last 3 years, we have reached an average of 270% of growth per year ; this year, we have doubled the size of our teams. We are currently developing new products to boost our growth, like our marketplace 360Learning Universities, which offers online courses for professionals. 2) NB: What organization problems were you trying to solve with your ‘convexity framework’? What were the difficulties in scaling up that your young organization was facing? What symptoms did you observe to detect the disease? Morgane: First, everyone in our organization is convinced that work as we know is about to change. We’re quite young (27 years old in average), and a lot of us have already worked before, and experienced the issues traditional organizations are facing: lack of motivation, absurdity of the processes, weight of the hierarchy… Organizations today tend to look like monsters of complexity and fail to generate growth and engagement from their employees. 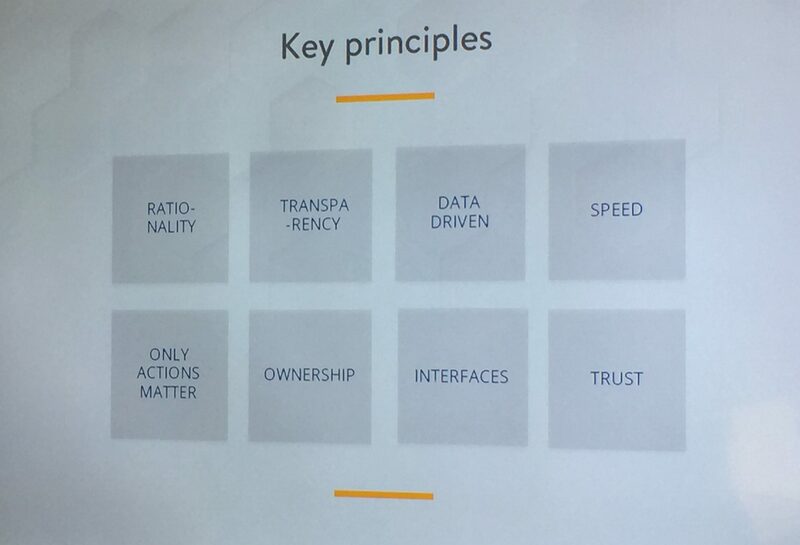 These are precisely the frictions we are trying to resolve in our organization, and it was also a big part of the original vision of our founders: trying to create a new model of organization able to deal with complexity while generating growth & well-being, by creating the most rational and healthy workplace as possible, step by step. This is the way we work: identifying a friction, and then trying to resolve it. For example, for us, authority and hierarchy are frictions which have a cost: energy, time, and motivation. 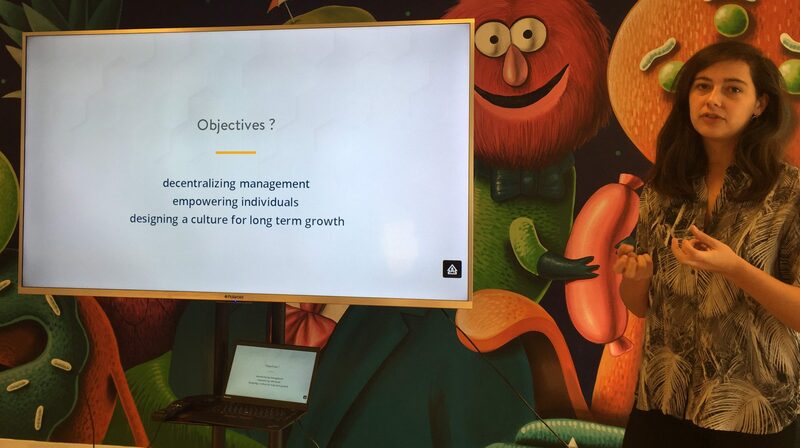 We believe in flat, decentralized organizations. This is the best way to create resilience, to empower individuals and to develop engagement. It means that we have no managers here at 360Learning. Each of us has to take its own decisions within its own scope. To make that possible, we had to clarify each scopes by using interfaces, such as Trello, a project-management tool, and define clear ways to operate on a daily basis without any managers. Beyond that conviction, we also had to face a lot of new challenges overtime, which made us constantly question our organizational model. For example, going from 4 employees to 12 raised a lot of issues. It was the case in 2013. Let me give you a specific illustration. At one point in 2013, a few months after our series A, our founders went on holidays for 3 weeks. When they came back, they had to face a huge customer dissatisfaction – and no one knew why. They tried to understand the problem, by digging into the CRM and the mails exchanges. And they realized it was a complete mess. Information dispersion, lack of transparency about the state of the relationship with our customers, etc. So we decided to create clear and transparent processes. 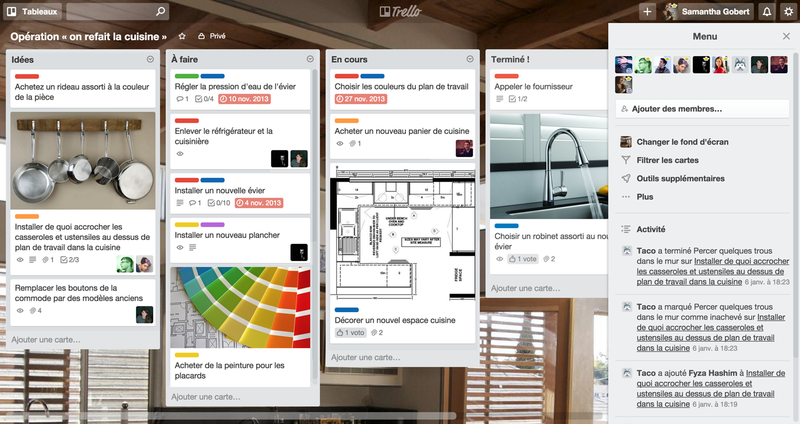 To do that, we relied on Trello, where we decided to log every business-related information. To enforce that, we banned internal meetings and emails, always to avoid information dispersion. The next step for us was to deal with complexity, as we grew bigger – thus we reinforced the notions of scopes and ownership: 1 task =1 owner, clearly identified inside the organisation. Next step was to ensure that every newcomers understand quickly the way we work and adapt himself to it, while the best working practices we have put in place keep being used, and optimized on a daily basis. To do that, we formalized a cultural framework, based on written, micro working practices. 3) NB: What are the concrete tools you suggest to adopt to develop decentralization, empowerment, culture for long term growth? What collaborative tools you teams are using, and for what purpose? At 360Learning, the pillars of our framework are Trello and our own product, which we use to centralize the best practices, train ourselves and optimize our working methodologies. Every member of our organization use these tools on a daily basis. We also use several others tools, more specialized, like SalesForce, GitHub, Marketo or Zendesk. In the end, the idea I would like to insist on is that these tools are not what condition our culture; it is the way we use them. The use of each of these tools is conditioned by a practices code. For example, we use Trello in a very codified way. From structuring a board to dealing with requests, or even writing a feedback on a project, we have documented a lot of micro working practices. These practices are constantly optimized, as we grow and learn new ways of working more efficiently. Newcomers are trained to theses practices, and we assess them continuously to make sure that they are always shared by the integrality of the organisation. 4) NB: How do you make scaling consistent with roles and skills progression? Morgane: As each person’s scope is based on the interface he or she operates, the scope keeps evolving as we keep growing. That’s the main interest of interfaces-based scopes: you can combine them very easily, as new needs appears. More, beyond documenting working practices, we also document every aspects of our jobs. This allows to have a knowledge base on every skills & knowledge needed to perform well on a specific job, and to create training paths adapted to this job. This means that if, let’s say, a sales team member wants to develop his skills on product management, he will have to validate a certain number of steps to be able, first of all, to interact with the product team – and then, be able to learn how to deal with it. 5) NB: You’re speaking of ‘designing a new type of organization whose DNA creates growth and fulfillment’: is this your internal mantra? How does it match with your business value proposition? Morgane: Yes it is, and I think this is probably what thrills people the most in this company. The fact that we are experimenting a new way of working is very exciting for the kind of people who work here. More, everyone is associated to this experiment, because one of the main components of our framework is to to create continuous optimization loops, in each part of the organization. And I think you can see the evidence of that state of mind in our product and in our vision of learning, because they are based on the same values. We introduce ourselves as the LMS of the digital area, which for the first time in history allows anyone, without any technical skills, to create & distributes its own courses at scale, while creating engagement amongst its users, and at a reduced cost. Decentralization of the courses production, empowerment of the experts who operate their job everyday, lean methodologies, A/B testing on the courses, etc… We use the same methodologies on a daily basis inside our organisation. On the other side, we are convinced that learning is maybe the best way to accelerate cultural transformation inside the organisations, by training people to use new working methodologies, to create their own courses and share their knowledge with their colleagues, and to adapt the courses to the rhythms of the business. 6) NB: Your Convexity kit is quite impressive. What’s its origin? Does it come out of a collective work? This was initiated by Nicolas Hernandez, our CEO, even before the first employees came in. Former student of Polytechnique, he also has a master degree in philosophy on Michel Foucault’s work – which gives you a good prism to understand our model. He has also always been interested in social models, and paradigms inherited from the web, such as decentralization and network resilience. His goal when he founded 360Learning was not only to reinvent learning, but also to try to build a new model of organization. He created the basis of the framework, and works everyday on its development, and implementation. A part of my job is to help him to design it, by confronting his ideas and producing first drafts, like for example the processes of documentation. But, as the framework strongly relies on continuous feedback loops, every member of the organization is meant to challenge and optimize it. We have designed loops at every level of the framework: on the framework itself, on the multiple processes on which it is build, on the content, and on the documentation produced, etc. We even associate our ecosystem on the design of the framework. For example, we are currently implementing in other companies of all type part of this framework; their feedback on what is working and what’s not is crucial for us, because it gives us a lot of insights and tips to improve it on a daily basis. 7) NB: How do new employees capture concepts like interfaces? Morgane: By training them to adopt micro working practices, not big empty values. For example, learning how to deal rationally with your emails, and doing it effectively is in my opinion much more impactful than just reading a presentation about it. This is why our onboarding process is really focus on these methodologies. They condition the way we work on a daily basis, and help us question our model and the way things work. The onboarding is also very gradual; thanks to the documentation we gathered, we can easily decompose the skills newcomers will have to develop overtime, and create step-by-step paths. Newcomers are also quickly encouraged to participate in the framework design, by giving their feedback on every aspect of the model.